Saint Patrick Catholic Church has almost completed the process of Long Range Planning for the next 5 years. To prepare for the future, a Long Range Planning Committee was assembled in June 2016. This team— facilitated by Barbara Eckert,of the Catholic Leadership Institute (CLI), and comprised of representatives from our parish staff, various councils and commissions, and at large members have undertaken the process of developing a long range strategic plan for the parish. The parish community has been kept well informed of the process and provided opportunities to participate in shaping the future of the parish through surveys and listening sessions. We can’t plan our future without your input. Your parish staff is committed to being open and transparent throughout the entire planning process. Check out the summary graphics below or click open the accordion files to dig deeper and learn more. The committee as a whole and individually has committed to prayer and hearing God’s Word through scripture and discernment. Working together with a spirit of consideration for each other. Being open-hearted as we take risks. Bearing trust, integrity, respect, honesty. Employing creative consideration with ideas, risk taking and challenges. Being open to God’s will. Using prayer, hope and discernment. Supposing the best in what others are saying, listening with openness, listening humbly, seeing the positive in the unintended consequences. Inspired by Pope Francis’ vision for dialouging in the Church, the Long Range Planning Committe is creating and implementing a process for reaching all parishioners for insights, needs and hopes. “The Pope has said that the Church should not be run like a top-down organization, with all authority and power radiating from the center; he said it should be an ‘inverted pyramid’ in which the Bishops and Pope exercise their authority and deepen their identification with Jesus ‘in serving the people of God. '”— Read more about the Pope’s thinking in the article Listening Church in America Magazine— The National Catholic Review. Parish media— from the conventional communication vehicles like the pulpit and the bulletin, to electronic newsletters like The Cornerstone, for the parish and The Blarney Stone, for the school; to social media like Facebook and myParish app. The team is employing all communications methods available at Saint Patrick Catholic Church— seeking to reach all parishioners and hear thoughts, ideas and needs from a wide range of demographics. The Long Range Planning Committee invited Saint Patrick Catholic Church to take the Pierce Deanery and Parish Long Range Planning Survey online. Small group listening sessions will be engaged at various times, ranging from staff and teachers, to councils and commissions, from ministry leaders to ministry groups with a focus on reaching all demographics; young and older, single and married, young families and empty nesters, those who attend Mass and those who might have fallen away. 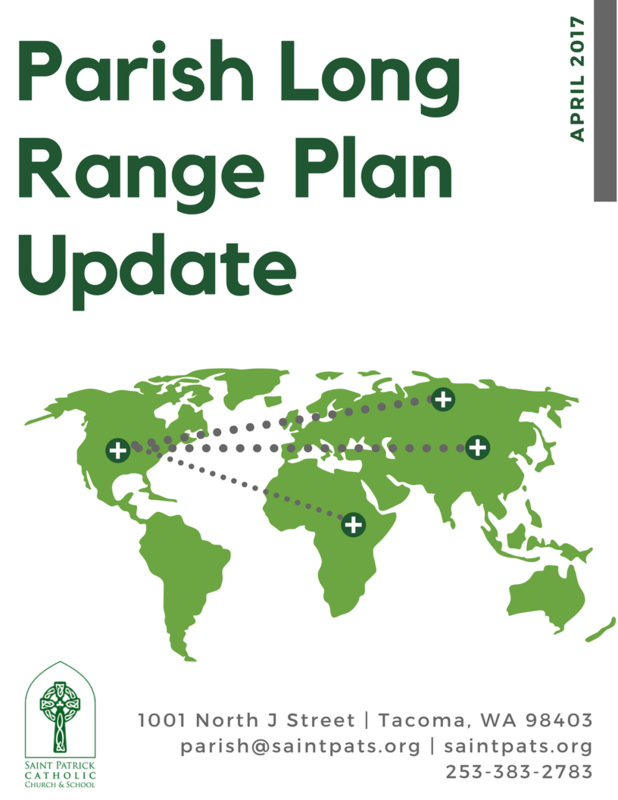 The Long Range Planning Committee with the input and feedback of the parish is considering the needs of neighboring parishes and opportunities to collaborate now and in the future, both short term and long term opportunities. The Parish Long Range Planning Committee is discerning the “mission that has us” and is simultaneously addressing the Pierce Deanery and Seattle Archdiocese challenge— looking beyond our traditional parish boundary models, to see what it means to be a “church community”— to see if there are ways current parish communities can collaborate and partner with one another to better serve the collective needs of Catholics in Pierce County. Along with the three parish values and priorities, the following mission statement was developed with the help of ministry leaders and the members of our Pastoral Council, Finance Council, Liturgy Commission, Faith Formation Commission, Pastoral Care Commission, and Development Commission. Like Christ, we share with all, an open-minded, non- judgmental spirit of welcome. Jesus, the Father’s great love shared with us, calls us to a deeper personal relationship with Him and to authentic relationships with one another. As disciples of Christ, moved by the Holy Spirit, we venture out in faith to share the Good News. Where should our focus be as a parish? How do we see ourselves in 5 years? Where will we spent energy, time and resources to serve in Jesus’ name? What strengths do we possess and are we using them effectively? What obstacles do we face and how can we overcome them as a community? What will we accomplish in the next 1 – 5 years? The Parish Councils and Commissions began to develop preliminary goals at a meeting in mid-April 2017. Our parish councils and commissions need your input in developing goals and objectives. We need our parish faith community to help with this important part of the planning. You will have two ways to share your ideas and recommendations for our parish. A survey and three listening sessions were offered in early May, before and after Masses, to give parishioners an opportunity to share thoughts on faith life and how we as a parish might reach out to people who are not in the pews, in support of our three Parish Priorities. The Councils and Commissions met in mid-May for a final review of the Parish Goals based on parishioners’ input. Continued dialog is essential as we roll up our sleeves and begin working towards the goals and objectives you will help us establish for Saint Patrick Catholic Church. The implementation is based on the goals and objectives identified by the parish. Click below for updates. Mid-Year Report: Where Have We Been &#038; Where are We Going? What&#8217;s Going on With Our Parish Priorities and Values?